In the Spring of 2010 as I was cleaning out the attic, I found some things that I did not want to throw away as it had some sentimental value. So, rather than keeping them boxed up and perpetually remaining in the recesses of the attic, I decided to make a space that doubled as a “mini museum” of personal items. As I was just starting to explore craft beer at the time, a mini bar came to mind and the Pub Project was born. The shed: It was a normal garden shed built from a kit by my Father in 1970. In 1994, he asked if I wanted to move it to my property as he no longer had a use for it. So my Father, Brothers and I moved it to my home and placed it in the corner of the backyard – thus the reason ‘corner’ is in the name. It’s dimensions are 7’4″ wide by 9’4″ deep by 6’4″ high. In the Spring of 2014, my Brothers and I added the porch and I painted the shed it’s deep forest pine green, accenting it in flat black. In the Spring of 2016, my good friend, JC, helped me set the posts for the beer garden and then in the Summer, set the roof structure. A few weeks later, I put the recycled sheet metal roof on and waterproofed it. 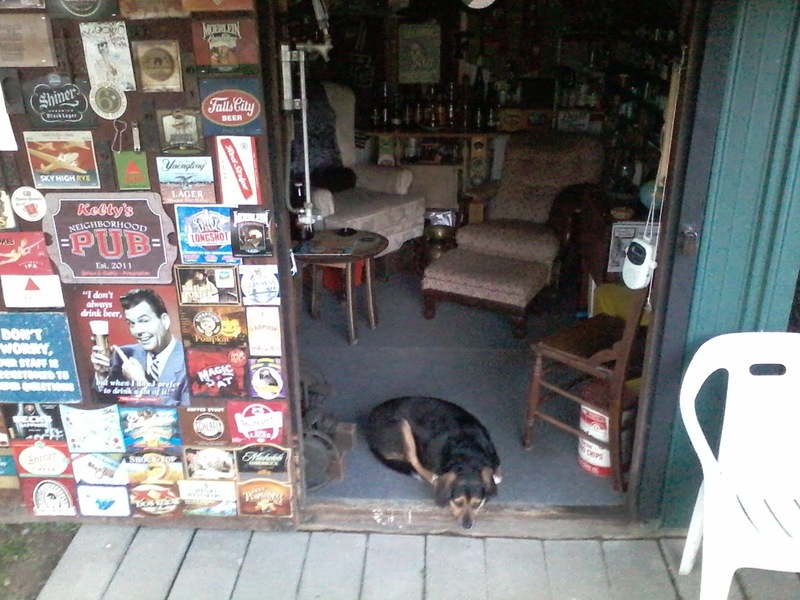 I brought home some recycled doors from Madison, IN and placed them as a backdrop to the Beer Garden. I added a recycled window on the side of the Pub to open into the Beer Garden and I was given some stone pavers by my Brother Aaron to use around the entrance and the Beer Garden. At that point, I would say that Kelty’s Corner Pub is completed, however; it never really is. I add things, particularly to the interior decor so patrons always find something new and interesting. Undoubtedly the smallest Pub one could visit (only seats 3 inside comfortably), but I think it adds some character to the neighborhood.